A small annoyance of mine is that the blogroll widget only allows me to display 300 of the 1000 or so blogs which I follow so sometimes a horror blogger quits the scene for months before I notice it. I've often been criticised for following over 1000 blogs (and for writing half a dozen of them myself), but if I didn't do so then I wouldn't be able to write this post about them. The only drawback (even for someone as internet addicted as myself) is commenting everybody, but since I've lost another two followers this month because of the things I say online, perhaps that's a good thing. 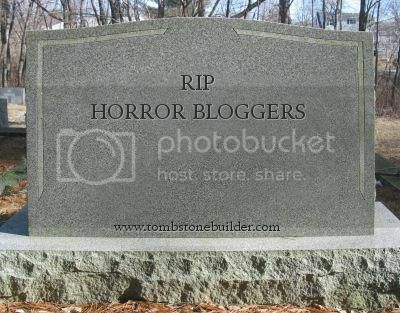 Anyway, without further ado, here's a list of what appear to be dead horror blogs. What happened to these guys and ghouls? 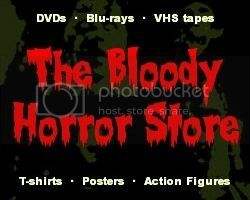 Hack and Slash Horror Blog. I don't know if, like me, they just had enough after Hallowe'en last year and the dearth of new horror movies which followed, if the writers themselves physically died, had their internet connection shut off, or if they've simply moved on to Facebook, Twitter or Wordpress (as Blogger tried to force a new dashboard interface onto us all). I do know that blogging isn't for everyone and I also know how difficult it is to make a comeback after being away from it for a while, but even the worst of these bloggers had something to offer which will be missed. I already miss their comments even though I've never had all that many from anybody. Sometimes there simply isn't a comment possible depending on what you write about. If you wrote one of these blogs and you are still reading mine, let me know the reasons why you gave up.